Hello there! Just popping in a with a pear card, to say hi to you, and let you know we've got TWO graduates in the house! Last week, both of our girls graduated - one from 8th grade, one from high school. What an exhilarating time it was! Our oldest received two scholarships, which helps tremendously with her college expenses. Our girls, moving onward and upward! Oh, my, you've got one off to college already! They just don't stop growing up, do they? Beautiful girls and, yes, those scholarships will help. 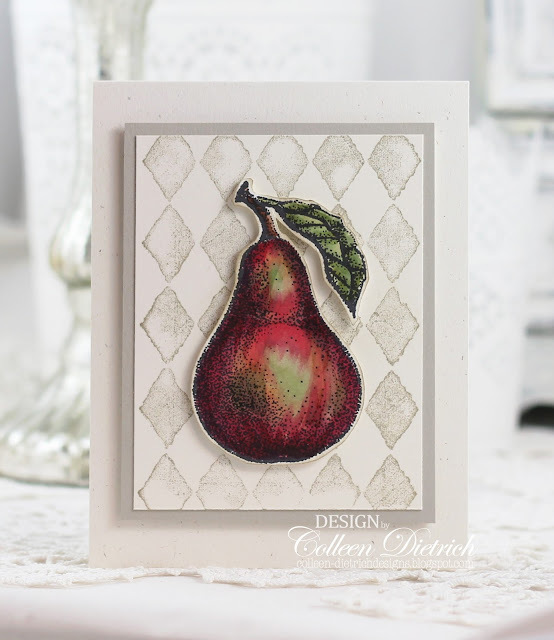 I absolutely love the artistic simplicity of your pear card. Kicking myself for gettnig rid of that BG stamp. Lovely card and congrats to Haley on the scholarships!! Great mix of cards you have posted too - can't comment on all of them but have seen them :) Love the black and grey pinstriped shirt for dad. How PRETTY!! Can't compare to your graduate though, many congrats to your girl! !